Roasted carrots and parsnips are a staple of roast dinners here – but I feel the orange is underrated in the festive period. We have mackerel pate and clementines for Christmas lunch (the roast is in the evening), and Santa often leaves a clementine in our stockings. When there are so many rich meaty flavours around you don’t need a lot of extra seasoning – clean, fresh citrus flavours are just perfect. I love having everything home made for Christmas dinner, but I resent spending the whole day in the kitchen. I therefore aim for low- attention low prep recipes that are still full of flavour. This recipe has so few ingredients – and avoids the need to par-boil the vegetables. That longer cooking time means you can get on with other things – like sherry, mince pies, and Christmas TV. You’ll need to check them periodically to turn any crispy ones over, and add the orange part way through, but that’s it once they’re in. Do you like your roasted carrots and parsnips soft, or crispy? It’s the pillowy softness of the insides of roast potatoes that my husband loves, whereas I prefer a crunch. My son likes his food soft. I cut the pieces of carrots and parsnips different sizes, in proportion to the different sizes of the vegetables. This meant that some became lovely and soft, whereas some gained a nice crunch. Similarly, the way the vegetables absorbed the orange flavour was mild enough for my three year old and tasty enough for the grownups. The sweetness of the orange will perfectly compliment your main dish, without overpowering it. The other great thing about these simple roasted carrots and parsnips is that they are perfectly vegan. They’re also designed to compliment meats. So if you have both omnivores and vegans, vegetarians or pescatarians in your family, this side dish should wow them all. The picture above features my slow cooker marmalade ham – why not try them together? An easy, flavoursome roasted vegetable side dish perfect for festive occasions. Serves four as one of a number of side dishes, or two as the only vegetable. 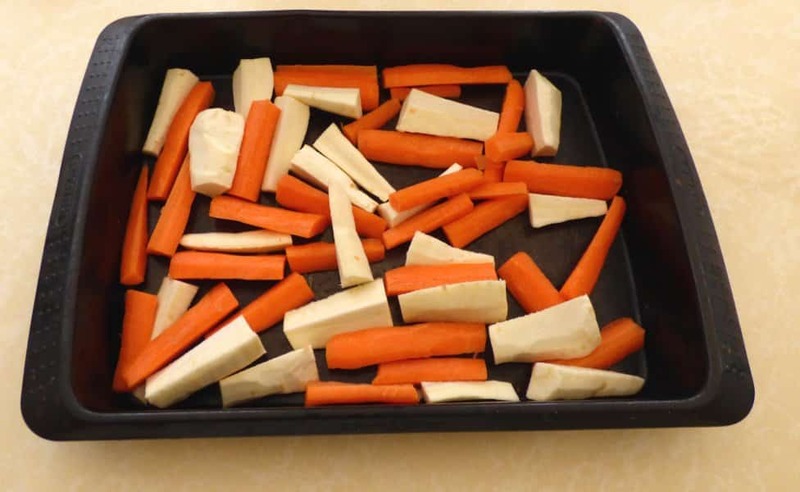 Chop the carrots and parsnips in half and cut each half into four lenghthways strips. Arrange on a banking tray with the olive oil. Try not to have them too bunched up but they can overlap a bit. Cook for 40 minutes on gas mark 9. Check occasionally and turn any pieces that start to brown. Zest the orange and juice half of it . Stir the zest and juice into the carrots and parsnips with a dash of vinegar. Cook for a further 40 minutes on gas mark 7. Check occasionally and turn any pieces that are getting crunchy. These look so lovely! I agree with you, I love making everything homemade for big holiday meals, but then again don't want to be slaving away the entire day in the kitchen - dishes like this are just the best of both worlds! Thanks :) Easy home made sides for the win! 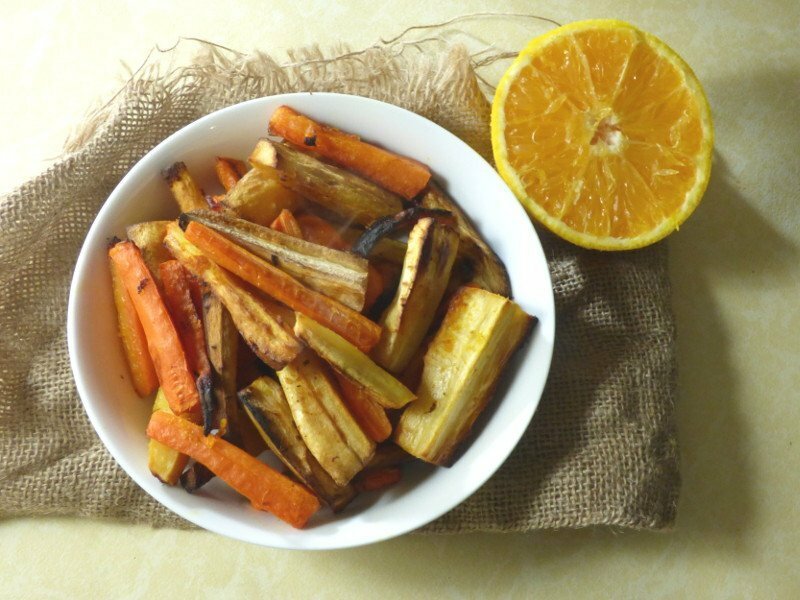 Roasted carrots and parsnips sound so delicious! I love that these are vegan and a low attention dish because I'm not a fan of spending long hours in the kitchen during holidays! Great recipe. 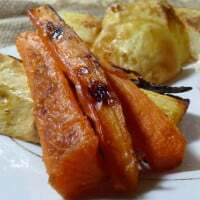 Roasting is my kids favourite way to enjoy their veggies, I love the sound of the orange and will be trying the next we do carrots. Such a great and healthy side dish! I always look for delicious and not-so-fattening sides and this is just perfect! The combination of the carrots and parsnips with the orange sounds so interesting and I just can't wait to try it. These look so good and I know my family will love this !